Agape Love Designs: Take Advantage! and trying to get your shop or blog more attention? Well I would LOVE to help you with that! Right now you can SPONSOR Agape Love for FREE! on my Sponsor Page, please check it out! and growing my blog and my own business as well. The bigger I get (and Im growing every day) the better it will be for you. get them more followers and good attention. Im not trying to sound conceited here, but I am positive they would say yes! Now, why am I bringing this up you may ask?? Im up to 400 followers and Im pretty excited! yeah, to some thats no big deal and to others it is monumental! out.. I have been doing so much better! I am proud of myself and my blog! I have pride in my sponsors and the work I do for them! And I want to work for YOU too! (well its been the plan all along..
that once I hit 500 followers my Sponsor options will be changing! nothing will change until your sponsor time is up.. I am working hard and a little extra cash is deserved. Ad time will be shortened for the free and semi free options. It will go down to one month of advertisement, from 3 months. Check out my Sponsor Page, and email me today! And thank you so much for your interest! And a BIG thank you to all of my Followers old and NEW! 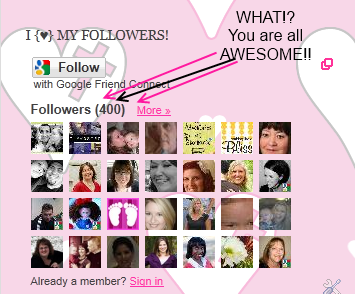 So excited about your followers!!!! That is awesome.